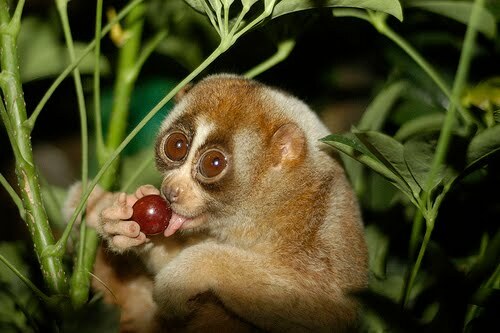 ACS: The Slow Loris, Cooler than the Sloth? The Slow Loris, Cooler than the Sloth? Coming straight out of Asia it's the Slow Loris! This very cool bug eyed little Primate, consists of 5 species that hang out in places like China the Philippines and India. Slow Lorises or Lori (? ), are usually under 20 inches (50.8cm) long and under 3 lb(1.3kg), but despite their less than impressive proportions you wouldn't want to make an enemy of one, they have toxic saliva, which they procure by licking a gland on their arm. The Slow Loris is a nocturnal arboreal (tree dwelling) creature, so if you want to chill with them you got to go up in them trees at night. These furry little dudes are omnivorous so they will eat anything they can fit in their little poison mouths. Best of all Slow Loris are very very cute but I personally would not make a pet of one, I would treat him or her as an equal and you should too! It’s interesting to note that the only actor capable of portraying a Slow Loris is Andy Serkis, and he is rumored to be playing one in the upcoming Paramount Vantage production The Fast Loris.